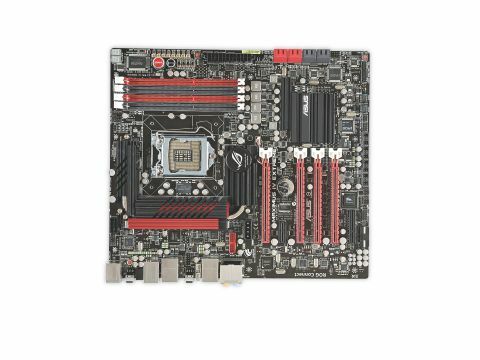 Is this the best Sandy Bridge motherboard? An awesome companion for Intel's new chips, but currently there are drawbacks to the P67 discrete chipset. When it comes to new PC components, odes to awesomeness are often overwrought. But take it from us, Intel's new Sandy Bridge desktop processors proved worthy of our finest prose. The Intel Core i5-2500K and Intel Core i7-2600K chips are preposterously quick. Of course, to get the best out of them what you need is a damn fine motherboard. For example, the Asus Maximus IV Extreme RoG. At least, that's what Asus would have you think. This latest board from the enthusiast-class Republic of Gamers line is based on the new Intel P67 chipset, one of two consumer-oriented platforms for the new Sandy Bridge chips. The P67 is the discrete graphics alternative to the integrated graphics H67 chipset. On the downside, that means you can't use the integrated graphics core that comes with all 14 of the new Sandy Bridge desktop CPUs. Normally, we wouldn't class that as a major disappointment. After all, the history of integrated graphics has been one of awful performance. However, Intel's latest effort is the best we've seen by miles. On the upside, the Asus Maximus IV Extreme RoG is absolutely, positively rammed with high-performance features. Highlights include no fewer than eight USB 3.0 ports on the rear panel, remote control overclocking, a seriously snazzy graphical firmware interface and much, much more.